Where else but Japan could you buy a miniature version of Edvard Munch’s “The Scream” figure crouching over a squat toilet, horror-struck? It’s one of thousands of ingeniously designed trinkets you can buy for a pittance from toy machines across the nation. They’re subversive, beautifully crafted and often hilarious. They are gachapon. 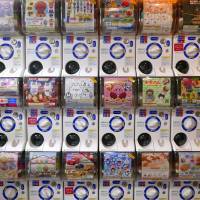 “Gachapon” refers both to vending machines and the capsule toys they spit out. When you crack open one of these plastic eggs, you’ll never know what you’ll get even though it’s part of a defined set of toys. 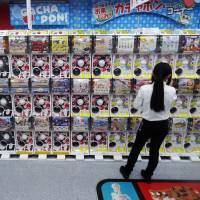 That’s only a fraction of the fun of gachapon, a roughly ¥30 billion industry with 150 new toys hatched every month. While capsule toys originated overseas, gachapon are uniquely Japanese. If you grew up in North America, chances are you raided your piggy bank to feed gumball and capsule toy machines made by Oak Manufacturing, Beaver Machine and other manufacturers. For a fistful of quarters, you could go home with a jawbreaker in your cheek and a pocketful of miniature playing cards, die-cast animals, toy soldiers, rubber monsters and other novelties. Then you grew up and forgot all about the trinkets you once coveted. In Japan, however, childhood seems to enjoy an extended lease. And gachapon are loved by kids of all ages: At the capsule toy corner on the sixth floor of Yodobashi Camera’s Akihabara outlet, you can see boys and girls and men and women, even suit-and-tie salarymen, jamming ¥100 coins into stacks of machines, perusing the display cards and hunting for a rare prize. Akihabara is a mecca for otaku geeks, a moveable feast of subculture products, and gachapon can easily be overlooked in the riot of anime and electronics. But step outside of Yodobashi Camera and you’ll find gachapon shops along Chuo-dori, in the back streets and at the station. 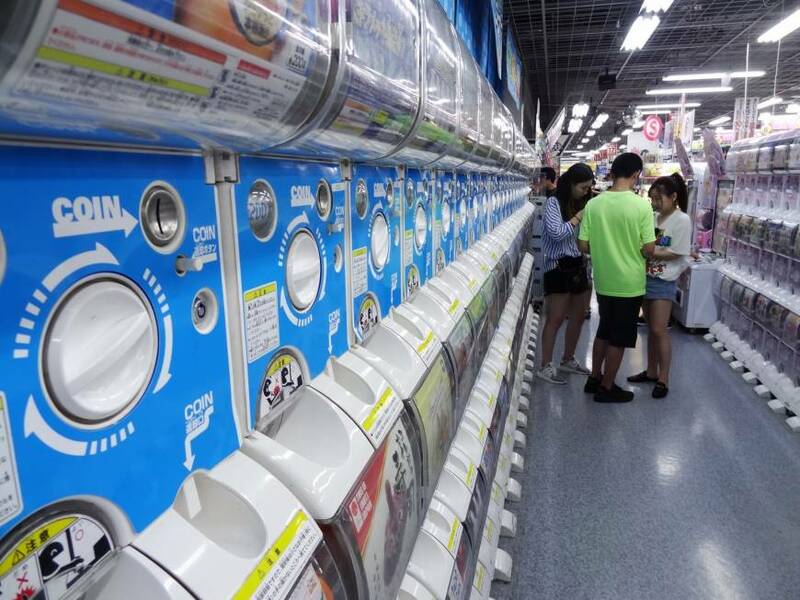 At Gachapon Kaikan, a legendary specialist shop that has been around for about 16 years, there are some 500 gachapon machines and 60 percent of its clientele are non-Japanese. Like modern-day netsuke accessories, gachapon are remarkable for their multiplicity, craftsmanship and sheer wackiness. They’re miniature works of art in plastic. There are gachapon sushi, cars, motorcycles, bicycles, dinosaurs, trains, insects, Tokyo Towers, manekineko cats, daruma dolls, Mount Fujis and samurai. There are oodles of popular anime and manga characters on Lilliputian scale from franchises such as Pokemon, Anpanman, Sailor Moon, Dragonball, Doraemon, One Piece, GeGeGe no Kitaro, and, of course, Gundam. And then there are the progressively wacky gachapon. These could fill an encyclopedia, but here’s a selection: capsules containing tiny office chairs, backpacks, camping lanterns, water faucets, wrist pillows, traffic lights, raw eggs, stretchable tamagoyaki, pizza toast, ramen, pygmy hippopotamuses, aquatic animals wearing bowties, cats showing off their butts, headscarves, bunny ears and penguin bonnets for cats, police caps for dogs, whales with oversized chins, the Statue of Liberty hoisting a glass of beer, cute girls with snail shells on their backs, Easter Island Moai wearing lipstick, underwear and sweaters for plastic bottles, futons for smartphones and — drumroll, please — Godzilla formally apologizing at a press conference podium for wanton acts of destruction. Now who wouldn’t spend ¥300 for one of those? While modern, coin-operated vending machines selling postcards and gum date to 1880s London and New York, the zany, freewheeling culture that is gachapon began with an entrepreneur named Ryuzo Shigeta, known today as Gacha-gacha Ojisan. In the 1960s, Shigeta and his brother had been exporting cheap goods to the United States and a partner there sent them an American vending machine known as a bulk vendor. For ¥10 a pop, it would spit out candy and cheap toys, but they came out willy-nilly, all mixed together. Shigeta found that unsanitary and frustrating, and had a brainwave: Why not encase each product in a plastic shell? On Feb. 17, 1965, gachapon were born when Shigeta set up the capsule vending machine at his shop, Penny Shokai, located in Kuramae 3-chome in Tokyo’s Taito Ward. For the next 10 years, gachapon featured cheap novelties made with scrap plastic. Manufacturers such as Konno Sangyo Co. also pioneered the industry but it was revolutionized in 1977 with the entry of a toy giant: Bandai Co. Founded in 1950, Bandai was a trailblazer in gachapon. 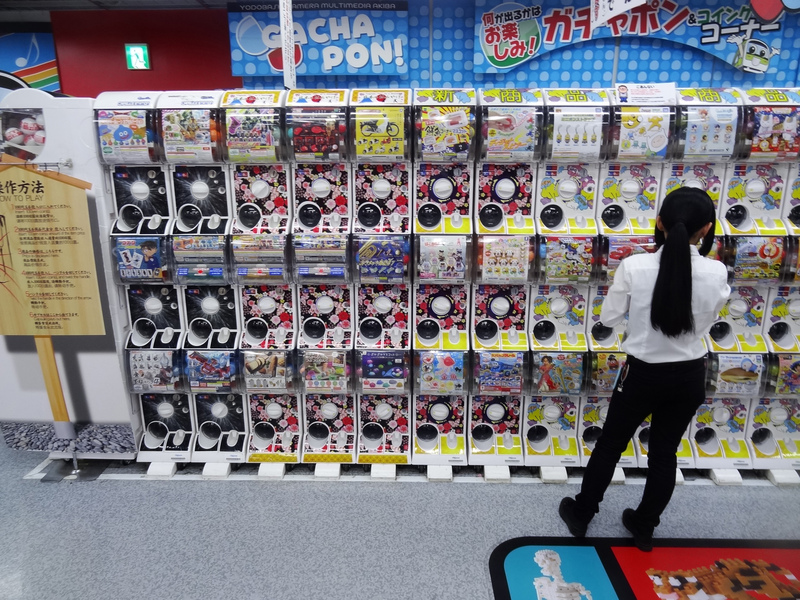 Aside from trademarking them as Gashapon, its executives gambled that their capsule toys would sell even if priced at ¥100 a pop, much more than competitors who were offering ¥20 trinkets. That gamble paid off in spectacular fashion. On the back of Gundam, Kamen Rider, Ultraman and other popular brands, Gashapon lifted capsule toys to new heights and Bandai sold an astonishing 3.4 billion units in the 40 years to March 2017. The company says it has some 360,000 vending machines across Japan and claims a roughly 70 percent market share; it has some 20,000 elsewhere in Asia. Hand-carved in Japan as prototypes, then manufactured and hand-painted in China, the Philippines and elsewhere in Asia, Gashapon lead a brief retail existence. Bandai launches 30 to 40 new Gashapon every month, priced at ¥100 to ¥500 apiece, with some tied to seasonal events. Popular Gashapon can sell out in a week or two; while some see repeat production runs, the vast majority are done after only one batch. There have been three gachapon booms. The first was in 1983 with the launch of Kinniku Man Keshigomu; Bandai sold more than 180 million units of the polyvinyl chloride muscleman erasers in over 400 varieties. This emboldened Bandai to launch capsule toys priced at ¥200 in 1991. The second boom began in the mid-1990s with the appearance of full color, detailed Gashapon figures such as the SD Gundam series. This attracted an increasingly adult clientele, especially collectors and fans of anime and manga. The third boom began with “Yokai Watch,” the hit multimedia franchise that debuted in 2013 as a Nintendo 3DS game. Meanwhile, gachapon have grown more sophisticated, with intricate items that require assembly. They can include up to 24 joints and even have glowing LED eyes, as seen in the Ultraman Ultimate Luminous series. The evolution of gachapon hasn’t been confined to toys. Gashapon machines were at first large and clunky and delivered the capsule to a basket at the bottom. Today they’re slim, double-decker affairs, allowing them to be lined up by the dozen in compact rows. This can be done anywhere, since most don’t require electricity, though some of the newer models do because they can accept payment by smart card; some capsule toy machines even work with large video or lottery game screens. While originally confined to dagashiya neighborhood candy shops and the roofs of department stores, gachapon are now found everywhere, from street corners, convenience stores, supermarkets and electronics retailers to train stations, airports, tourist spots and locations such as Gashapon Street in Tokyo Station. Capsules themselves have changed little over the years from the original design of connecting halves, one of polypropylene and the other of polystyrene. In recent years, however, Bandai introduced polypropylene-only versions that can be recycled more easily. 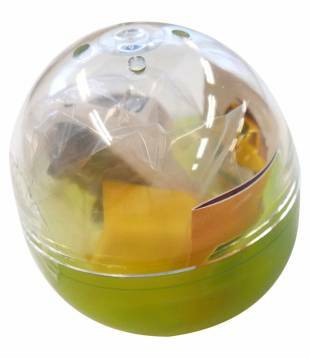 It also launched cylindrical capsules to accommodate larger products, as well as capsules that form the toy itself, such as the head of Doraemon or a Zaku robot from the Gundam franchise. Some capsule toys are a phenomenon unto themselves. A standout gachapon in recent years and one of the drivers of the third boom has been Koppu no Fuchiko. With a name that plays on the Japanese word for “edge” (fuchi), she’s an OL (office lady) whose outstretched arms allow her to hang from the lip of a glass or whatever else you fancy. Launched in 2012 and designed by manga artist Katsuki Tanaka, Fuchiko has been a smash hit among all capsule toys, with sales of 20 million units and more than 1,500 variations of her in various poses, wearing everything from Hawaiian dresses to Shinto robes. She’s extremely popular online — do an Instagram photo search with the hashtag #コップのフチ子 (koppunofuchiko) and you’ll find more than 145,000 hits — and even has her own set of Line stickers. Manufacturer Kitan Club, which has turned out some of the more bizarre gachapon in recent years, marked Fuchiko’s fifth anniversary with special sales and exhibitions. Indeed, Kitan Club has launched about 40 other “cup edge” gachapon under its Putitto series. Kitan Club and other makers have produced hanging cats, dogs, frogs, hedgehogs and penguins, anime characters from Pikachu to Golgo 13, “Star Wars” Imperial stormtroopers and even singer Shigeru Matsuzaki. It’s perhaps not surprising that gachapon have spawned a fan subculture that includes avid collectors. 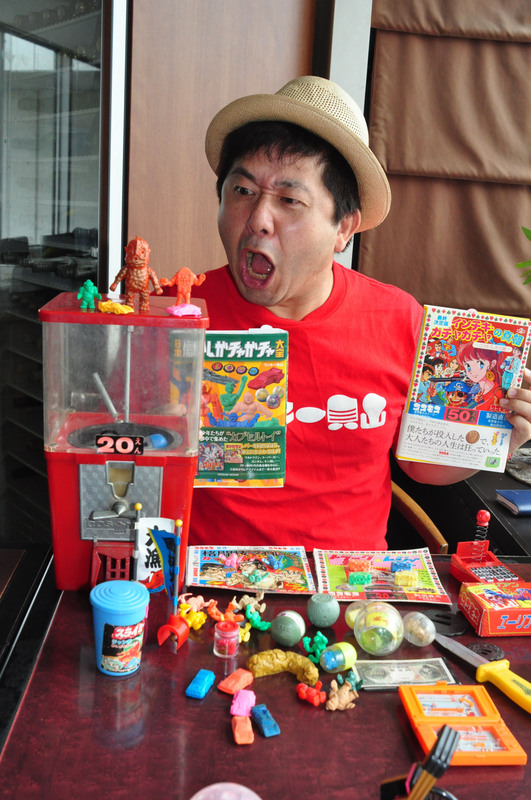 Waki Kaiyama is an author, TV and radio personality from Sendai whose business card features a cartoonish drawing of him holding a capsule and a gachapon machine. 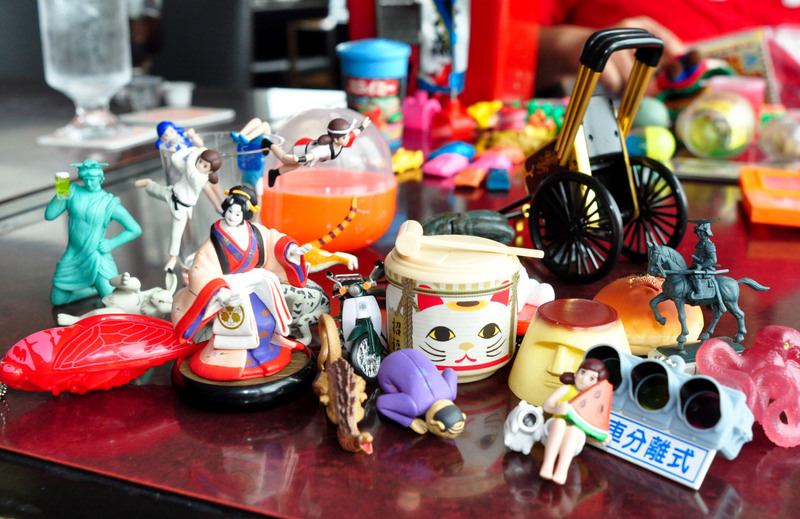 Kaiyama began collecting in 1977, the year Gashapon hit the streets, and is still going strong 40 years later. 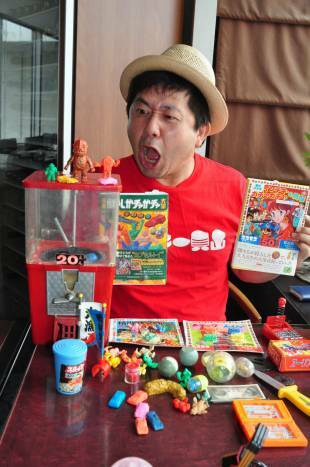 He now has an unbelievable 100,000 capsule toys and is known as the top gachapon collector in Japan. Kaiyama became addicted to the capsule toy drug through his grandmother, who ran a dagashiya candy shop with gachapon. When his parents were splitting up, she took him in. He didn’t have friends in her neighborhood, so gachapon became his friends. While other kids would buy them and eventually toss them out, he held on to them. A collector was born. Those views are echoed by another “capsuleist,” Hiroaki Omatsu, a journalist and gachapon fan who has just written his own book on the subject, “Gachapon Idea Note.” In it, he profiles not only dozens of crazy gachapon but the insights of about 10 designers. For instance, Hiroaki Haba of capsule toy maker Takara Tomy Arts created a series of richly detailed salarymen figurines called Kakkoi Ossan that are engaged in uncharacteristic action poses such as firing guns or baring washboard abs, all while keeping their neckties, glasses and comb-overs intact. The book quotes Haba as saying he watches a lot of movies and was sketching a typical middle-aged salaryman face in a meeting when he started thinking about how it could look cool. The result was a hit gachapon for 2016. “Gachapon that appeal to adults are a form of pop culture plus traditional Japanese monozukuri craftsmanship,” says Omatsu, who has accumulated more than 1,000 gachapon. “There’s definitely a nostalgic element to it. When we were kids, we didn’t have any money to buy these things but as adults, we can. 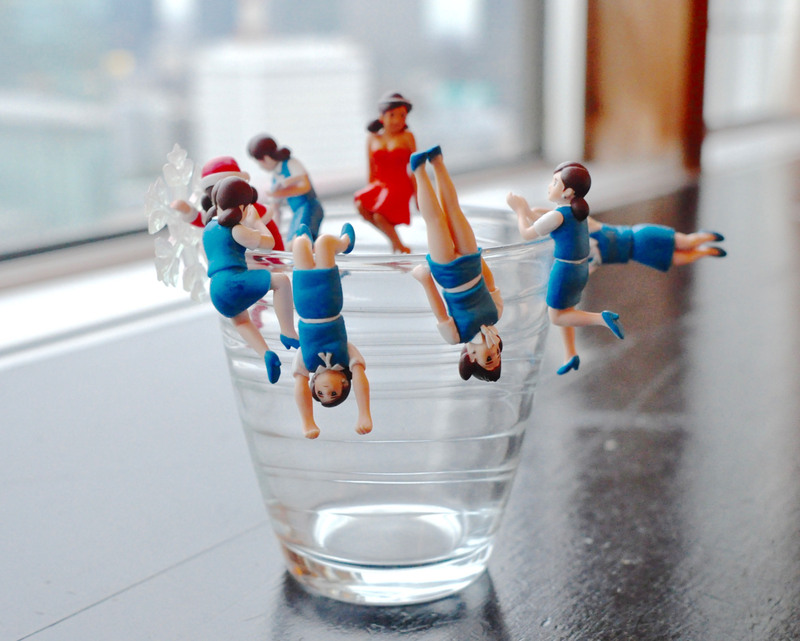 “However, gachapon can also be a communication tool, for instance as desktop ornaments at work. In an age of video games and virtual entertainment, gachapon are wonderful analog toys that haven’t changed for decades. 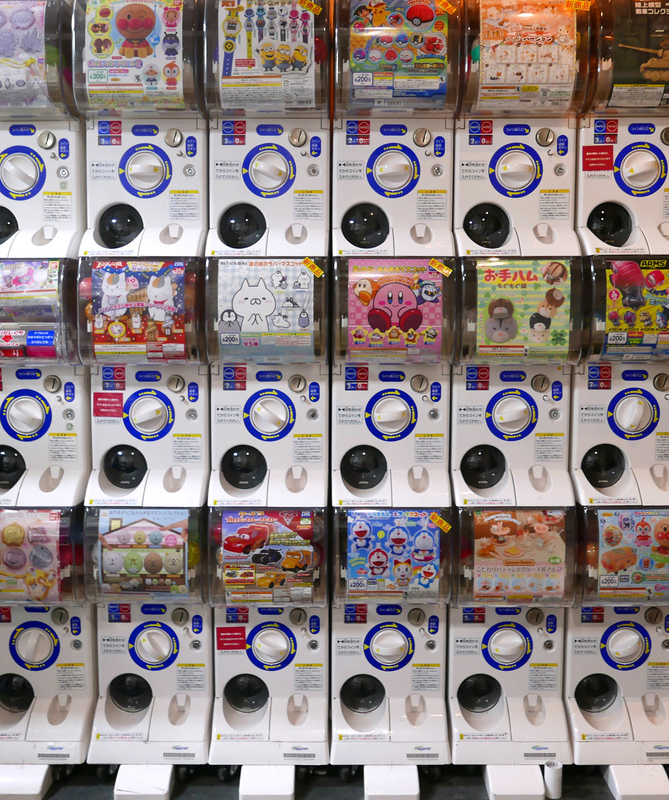 Capsule toys in Japan are known by various names, but the most common term is gachapon, referring to the toys and the vending machines themselves. It’s an onomatopoeia based on the sound of the vending machine crank and the thud the capsules make when spat out. Depending on demographics and trademarks, however, people may use a different term. Meanwhile, Bandai Co. calls its capsule toys Gashapon, while Takara Tomy Arts Co. uses the trademark Gacha. To make things slightly more confusing, not all gachapon sold under these makers’ machines are their trademarked products. For instance, Bandai machines also sell other companies’ toys, which are not Gashapon.